Literary ramblings, etc. 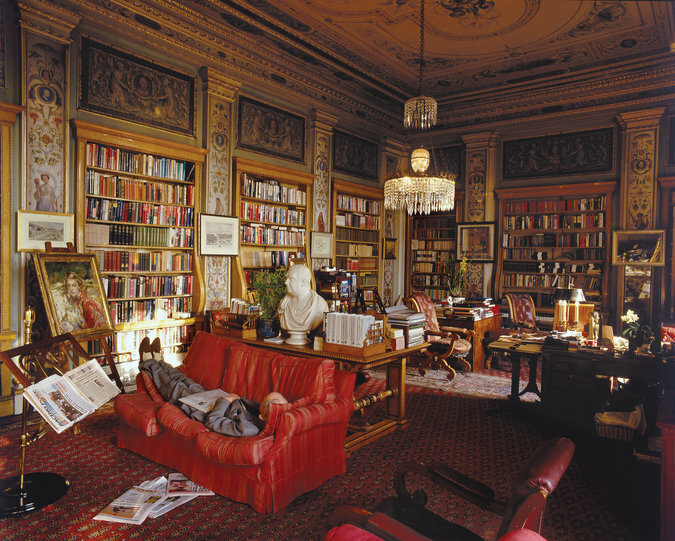 | "Book collecting…is not a hobby. Those who do it must do it" (Jeanette Winterson). 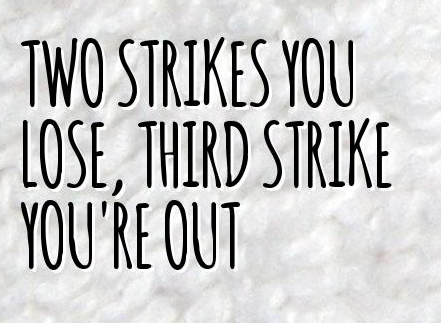 We’ve got an ongoing thing in our household, where I ask a question and Daisy says “Told you that yesterday, third strike and you’re out”. I spend so much time concentrating on the daily grind that I can’t be sure if it’s a genuine lack of concentration or the start of something more ominous, but one thing’s for certain – the months creep by, the crow lines round the eyes get deeper and you’d be pushed to call them laughter lines any more…and meanwhile the list of the number of books unread seems to be getting ever longer not shorter. Since picking up that blogging gauntlet just 12 months ago and dauntingly plunging into WordPress, a whole new world has opened up before my very eyes and it has been a true joy to share in this innocent yet oh so deeply fulfilling passion that is to be found in the written word with so many fellow minded bibliophiles. Daisy is keen to go off and study History in 18 months, and that has attuned us all the more here on the home front to words and wordsmiths every which way past, present and future. Watching a seventeen year old develop an equally almost obsessive love of literature will forever be an unbridled thrill. It’s a funny old thing with this baring of souls to a known and an invisible public, though. At 53 I’m not sure I’ll ever get my head around the momentary whirl and instant fix of Instagram or all this social media, sigh. It’s obviously not an age thing, and maybe it is in someway related to the poor old brain feeling addled by not being able to hold onto something or retrieve it at a later stage as an aid to memory (a brief flirtation with Snapchat left me bristling with palpitations – my version of hell on earth, truly). So blogging does feel like a good compromise – it’s sort of a lasting way to set something temporary on the plate, if that makes any sense? The downside to it is of course the time factor. 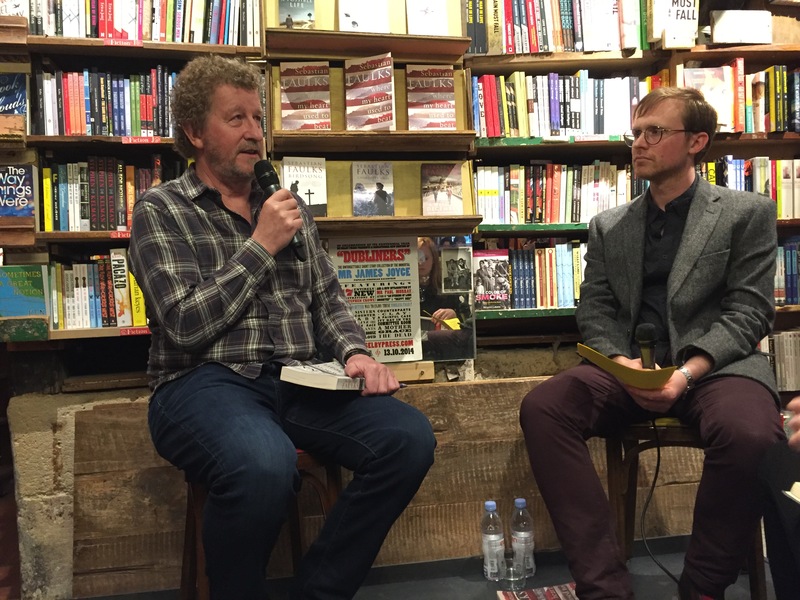 Went to Shakespeare and Company to meet (well, not personally) Sebastian Faulks last week and hear his take on his latest novel. Love physically meeting the People who are in Print and can never resist an opportunity for an autograph – another blast from the past, and will ever regret not going up to join the endless queue when Zadie Smith was at the same famous bookstore last summer. Faulks’s “Where My Heart Used to Beat” was not a standout for me in the way that “Birdsong” definitely was (although whether the abiding memory is of his text or the vision of a dashing Eddie Redmayne remains to be decided), but it does deal a lot with the importance of memory, and that reminded me a great deal of the excellent but harrowing “The Narrow Road to the Deep North”, so recently read, where Flanagan pontificates a lot over everything that just gets lost when a person’s memory of something is lost or the individual no longer exists. Tricky stuff. Wendy has been diagnosed with early onset Alzheimers and is raising awareness all around the UK and cataloguing her journey on her “Which Me am I Today” blog. My eyes misted over this morning reading Alison Bolas’s guest post, the piece is so beautifully written. She concludes that “one day at a time is just fine with me” and I’m joining her on that one in every way. Most of my days are spent haring around dreaming up ways to ensure people on holiday here in Paris have a perfect stay, and despite the sometimes frantic, Last Minute Dot Com nature of the job, it gives great satisfaction when you can really make people’s day. It’s hardly the most altruistic job in the world, but a little kindness goes a very long way in this mad world, I hope. So many funny tales that will sadly get lost in the swirls of the memory, from managing to hunt down a ridiculously expensive but very significant bottle of Veuve Clicquot La Grande Dame 2006 for a granny in remission bringing her grand-daughter for a once-in-a-lifetime trip to her favourite city, to leaving surprise bouquets of flowers and little misty-eyed-guaranteed messages for partners to discover on Valentine’s Day, to getting stuck in a cranky lift between the fourth and the fifth floor at midnight one evening never to be forgotten, delivering something for an early arrival next day… But whether that particular book will ever get written only time will tell. 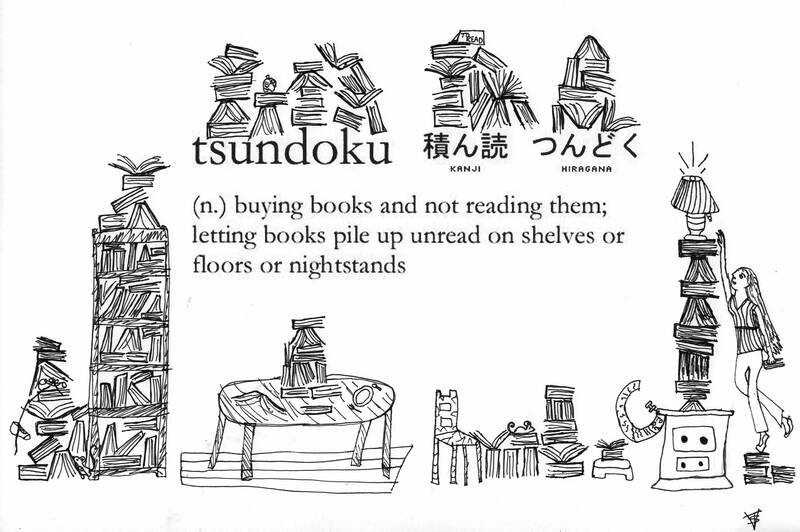 In the meantime am practically suffering from Tsundoko * Syndrome, read about in one of Lucy’s always hilarious posts with Sarah at Hard Book Habit, and have realised it’s time to redress a few balances and get on with some actual reading rather than the constant niggling compilation of list upon list. Found myself spending a couple of very pleasurable hours a couple of weeks ago collating a line-up of books based in Paris. Had to stop and pause for breath when it went the other side of a hundred titles. So that led me full circle to something I read a very long time ago. Susan Hill decided back in 2009 that she would take a sabbatical year and revisit her own bookshelves, resulting in her work “Howards End is on the Landing: A Year of Reading From Home”. She starts by confessing “I buy too many books, excusing impulse purchases on the vague grounds that buying a new paperback is better for me than buying a bar of chocolate”. So far so good, and it’s the quiche that always tempts me more than the M&Ms, but not to digress. Still on the choccy front, Ms Hill goes on to say, “Some people give up drink for January or chocolate for Lent, others decide to live for just a pound a day, or without buying any new clothes… I decided to spend a year reading only books already on my shelves… I wanted to stand back and let the dust settle on everything new, while I set off on a journey through my books”. Many of us did this with James’s three-month-long “Triple Dog Dare” challenge at the beginning of this year, and I can’t thank him enough for stemming my flow on the book-buying front. 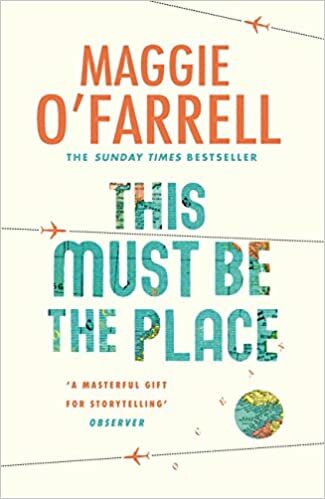 Time being so much of the essence at the moment, I have decided that I am going to stem the flow on blogging about ‘what I thought of this book’ front too, and take a sort of variation on the Susan Hill Sabbatical. Will continue to follow everyone’s blogs with rapture, and will update my many lists compiled on Literary Ramblings over this past year with the compulsive habit of needing to give my reads marks out of 10 as always, but will concentrate on the sheer reading of old and new, and take these next twelve months to see how well I can do on simply making my way through those Classics and those Baileys’ shortlisted novels between now and the Spring of next year. “The Four Quartets” by T. S. Eliot – 10/10. For now, over and out, and happy reading to one and all. That was the month (of March) that was, and ‘Tis an understatement to say how frustrating it was that reading had to take such a back seat. 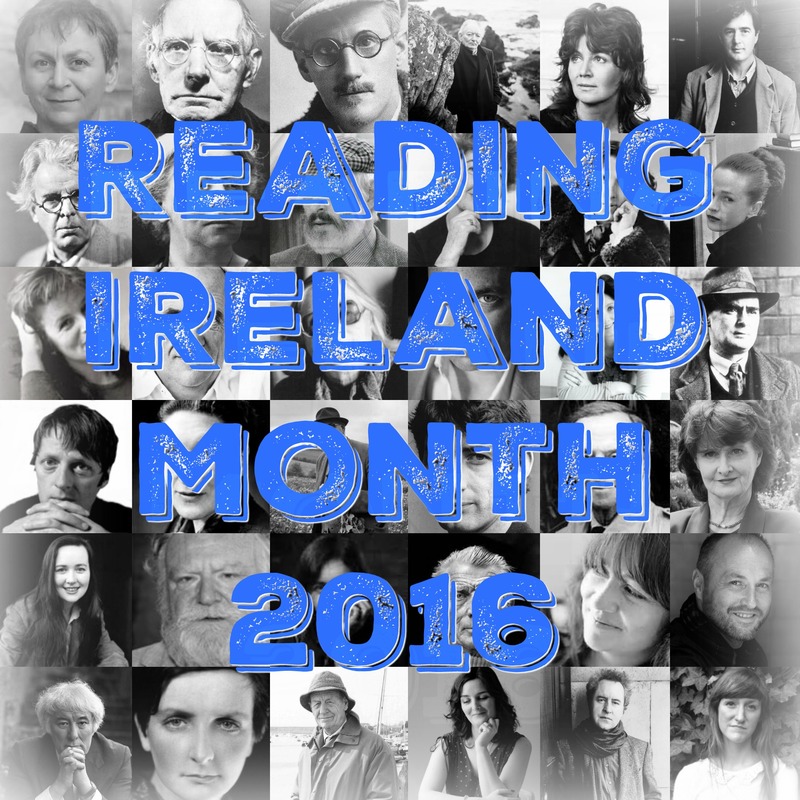 Have relished following so many stories of everyone’s Irish Reading Month adventures and will know to get a crack at this one ahead of time when the gauntlet is hopefully thrown down again next year. Thanks again, though, to Cathy at 746books and Niall at Raging Fluff for proposing the wonderful Begorrathon… have only just launched myself into it but am really looking forward to plodding on and discovering many more Irish novels, albeit belatedly, over the forthcoming months. The first read on my arm’s length list was the one everyone has heard about and so many have read and rated so highly. Have still yet to see the film (which many say is not a patch on the book? ), but having finally sat down and been swept along by the narrative, I can see what all the fuss is about. I suppose a guileless infancy with a cotton wool upbringing and nothing undue to write home about would make for a very dull tale, but from the very second paragraph on page one it is clear that this is going to be a no-holes-barred depiction of a traumatic and unforgettable start in the world: “When I look back on my childhood I wonder how I survived at all. It was, of course, a miserable childhood: the happy childhood is hardly worth your while. Worse than the ordinary childhood is the miserable Irish childhood, and worse yet is the miserable Irish Catholic childhood”. Survival is the word for it: very early on in the book his newborn sister perishes after just days in the world, then both of his twin brothers successively die at a point in the story where you fear there is little hope for anyone in the family to overcome the obstacles life is throwing at them. Talk about the bare necessities. 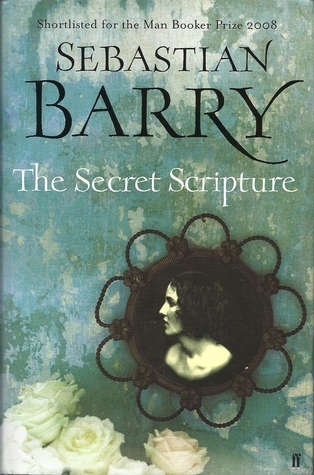 The story has had its silver lining: having moved back to New York at the hardened age of 19 for adventures that am keen to read about in the successive books of “’Tis” and “Teacher Man”, Frank McCourt went on to be awarded the Pulitzer the year after this first work was published and became a millionaire during his lifetime as a result of his writings. The story told was not without its controversies – this fascinating obituary suggests that the author took quite some licence in depicting the family’s destitute state and garnered outrage and ill-feeling among those who felt their “city’s reputation was besmirched by stories of the scabby-eyed McCourt children reduced to living on bread dipped in tea and feeding the fire in their damp-sodden home with wooden furnishings and coal picked off the streets”. 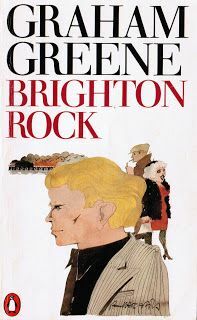 An uncompassionate and sometimes stony Church comes directly under fire and so do the drinking habits of the feckless father, who is absent throughout most of the book because he’s in the pub on one side of the sea or another. Class and the pride attached to problems of long-term unemployment are constant: I wept at Frank’s mother’s plight as the book progressed and at her sometimes desperate attempts at finding even short-term solutions to assuage the next drama likely to beset them. 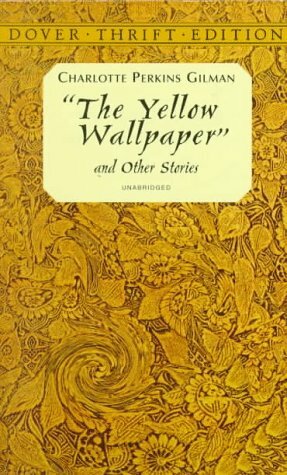 The tale is very much told from young Frank’s vantage point, for he is the boy-turned-man who becomes the father figure for his younger brothers and feels the weight of responsibility almost from the get-go, yet who also determines very early on to do everything in his power to leave for greener pastures at the earliest opportunity. 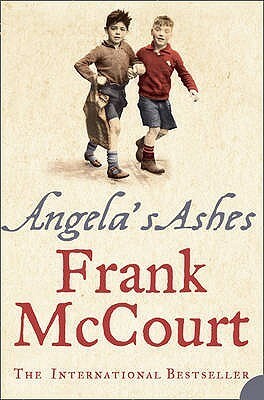 “Angela’s Ashes” is a profoundly moving read. You live and breathe these children’s daily lives: you can see and hear the leaky floods swirling downstairs that lead the family to need to ‘move abroad’ and decamp to the upstairs floor (“Dad says it’s like going away on our holidays to a warm foreign place like Italy. That’s what we’ll call the upstairs from now on, Italy”), just as you can visualise the fleas jumping and the lice crawling. You can smell their unwashed bodies and you can see their soles flapping as they trail the streets with the wonky wheel of the dilapidated pram clunking as they head back to the Dispensary to plead their case for welfare. Yet despite it all, right through this book there are moments where you smile and even laugh out loud: the young Frank is irreverent, moving and resilient, and the author’s touch is often very, very funny in the face of imminent disaster. “The next Saturday there’s no telegram nor the Saturday after nor any Saturday forever. Mam begs again at the St. Vincent de Paul Society and smiles at the Dispensary when Mr. Coffey and Mr. Kane have their bit of a joke about Dad having a tart in Piccadilly. Michael wants to know what a tart is and she tells him it’s something you have with tea”. “In fine weather men sit outside smoking their cigarettes if they have them, looking at the world and watching us play. Women stand with their arms folded, chatting. They don’t sit because all they do is stay at home, take care of the children, clean the house and cook a bit and the men need the chairs. 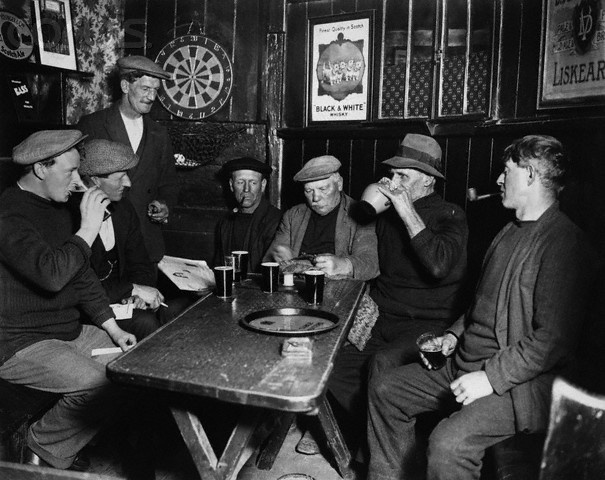 The men sit because they’re worn out from walking to the Labour Exchange every morning to sign for the dole, discussing the world’s problems and wondering what to do with the rest of the day”. 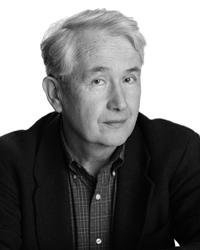 At the end of the day, I thought it was interesting that McCourt also dedicated this first book to the women in his life in his Acknowledgements : “This is a small hymn to an exaltation of women… I am blessed among men”. 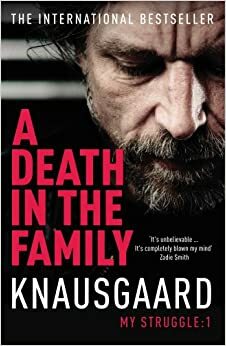 He went on to marry three times, but does not, however, specifically mention his mother in these words, and I read in The Telegraph (so it must be true) that she categorically denied the veracity of “Angela’s Ashes” before her own death. 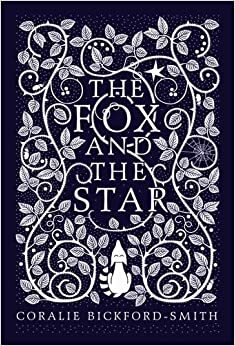 I had mistakenly thought the title referred to her ashes at the time of her demise before embarking on the story, but understand by the end of book one that it alluded to the tip of her burning cigarettes and her time spent gazing at the embers of a dying fire. I’ve only read the prologue to “’Tis” so far, but see that Frank’s mother is mentioned on this very first page, so will eagerly take up the tale now as he arrives safely in New York and the sequel unfolds. I hope she continues to figure in this second tome: she’s a fighter and a survivor and I’m as keen to know more about her as I am to read more about him. Onward and upward. Images taken from here and here, here and here. “A Little Life” by Hanya Yanagihara, 10/10 – SHORTLISTED 11th April, wonderful and a book that stays with you indefinitely. I recognise but 6 of the nominees, so is going to be interesting when the shortlist is revealed, and truly hope to do as last year and have read all six of the Chosen Ones by June. Continue to be thrilled that women’s writing is celebrated in this way – bring on the next decade of Baileys and their quest to bring writers to ever wider audiences. Well over half way through the self-imposed 3-month or so long book-buying ban, and so far it’s proving to be a lot less arduous than expected, although it’s a bit like avoiding food shopping on an empty stomach, and I only go anywhere near bookshops once the loin has been girded or have sternly reminded myself that I can look but I can’t touch. The idea is to famine not feast till April and that has turned out to be a blessing in disguise, as the twice-annual Parisian bun fight, sorry SOS English second hand book sale, takes place a bit later this year on the very first Sunday of that lovely month. With nary a charity shop in sight in this enlightened City of Light, getting hold of English paperbacks usually involves carting a ton of bricks back in an all-too-small suitcase after an all-too-brief weekend trip to the UK – fine on the Eurostar, but fraught with anxiety if flying and trying to sneak past the attendees to hoik your bulging case into the overhead lockers of the plane, squash squash. The SOS helpline book sale has therefore become an event of almost mythical proportions. Along we trundle religiously, determined to be the first in the queue and with fashion statement wheelie caddies in tow, usually containing a stash of outgoing books to optimistically donate and make up for the inevitable cartload that ends up coming back home again to clog up the shelves and the literary arteries. Wouldn’t miss it for the world – row upon row of books with possibly every English-speaking person in the capital inching their way along and trying to be patient with people who tenaciously move against the current and those who are so darned slow that you don’t know whether to risk stepping out of line past them or not, for fear of not being able to slot back in again. A fair bit of British restraint is often required not to stretch out and rudely swipe a treasure of a find spotted just ever so slightly out of reach, not to mention the very ‘non-cricket’ casual loitering by the entrance after a while to try and get our hands on new donations as they come in and before they get dispatched to the front line. It’s a laugh a minute. “Vinegar Girl” by Anne Tyler (June) – although thought the last one was announced to be the final one? “The Dark Flood Rises” by Margaret Drabble (November). “But my tips for 2016 are two books about Paris. “Les Parisiennes; How women lived, loved and died in Paris from 1939-49” by Anne Sebba (W&N, July) is about the resisters, collaborators, spies, jewellers, writers, housewives and singers who were left in a war-time city almost empty of men. And it’s not often that you miss your bus stop because you’re so engrossed in reading a book about existentialism, but I did exactly that while immersed in Sarah Bakewell’s “An Existentialist Café: Freedom, Being and Apricot Cocktails” (Chatto & Windus, March). The story of Sartre, Beauvoir, Camus, Heidegger et al is strange, fun and compelling reading. If it doesn’t win awards, I will eat my proof copy”. Mon 11th April – Baileys’ 2016 shortlist : let battle commence ! Thurs 9th June – IMPAC prizes awarded. Blink, and you miss it. The Oh Need To Buy list moves into the danger zone in April, then – and that’s even without reckoning on the Ones That Got Away and are still standing present and correct and unread on last year’s wish list. “The Beginner’s Goodbye” by Anne Tyler. Images taken from here, here, here and here, here, here and here, here and here, also here. One of the expressions I heard time and time over while living those ten years in the north of Italy was “Quando vieni al Sud piangi due volte; quando arrive e quando te ne vai” – the great North/South divide took great joy in bouncing off each other (and still does) and I can remember a Milanese taxi driver telling me with genuine concern as I plonked my heavily pregnant self down on the back seat on route for the airport for my mother-in-law’s sixtieth celebrations, dangerously close to my due date : “be careful, stai attenta, Signora, you don’t want the bambino to arrive while you’re in Roma”… The south has always held great fascination for being less ordered, less orderly, more subject to the secret laws that govern it – and the further south you go the more pronounced this becomes. Naples particularly has always been considered a law unto itself; I remember stories being bandied about of people having very enterprising strangers offer to help park their car in a very tight spot for them, only to have their knight in shining armour promptly disappear literally into the night behind the wheel of their vehicle, leaving them stranded (!). I also witnessed with great amusement the local reaction to the introduction of the law making the wearing of seat belts obligatory: a whole new cottage industry was born overnight, as the Neapolitans enterprisingly printed car-loads of T-shirts with a fake seat belt carefully printed and emblazoned on the front, and blatantly left the real belts hanging and unused as per usual. Sheer madness, totally irresponsible yet somehow engagingly creative all at the same time. Driving by taxi down from the Capodichino airport to catch the ferry to take us over to Ischia to where la Mamma spent three months every summer was always a heart-in-mouth experience, as the drivers weaved ferociously and highly dangerously along busy double-carriage highways, gesticulating and taking their eyes off the road and generally giving me a bit of a heart attack every time, especially when the kids were little. Never in all those years did we encounter a single scrape, but it was inevitably a hairy half hour, despite the nonstop chattering and cheery inquisitiveness of our chauffeur, and always a relief to stumble out of the airless car into the heatwave down by the boats taking us over to the island. We were so lucky. 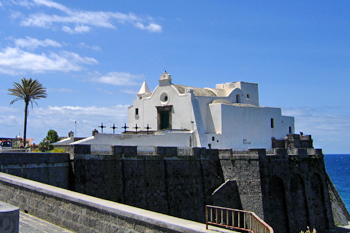 We actually got married on Ischia all that time ago in the most beautiful church imaginable at Forio, la Chiesa di Santa Maria del Soccorso, so at the opposite end of the island to where Elena Greco spends that summer in Book 1. Talk about an Anglo-Italian culture shock. Not really of any interest here, but it was a whole chapter of its own, and I wouldn’t have missed it for the world. By the by, for the wedding weekend and still on the taxi front, for instance, we sent all our non-Italian guests printed sheets to show at the airport, stating in beautifully typed Italian, “Please take us by taxi to the port at Beverello where our friends are meeting us – we know it costs about 60,000 lira”, simply to avoid everyone foreign being ripped off, and knowing full well that the taxi drivers would find this quite comical and would rise to the occasion – which to a man they did, and the tales are still told today of everyone taking their watches and any nice jewellery off, just to avoid arriving with less than they had set off with…. 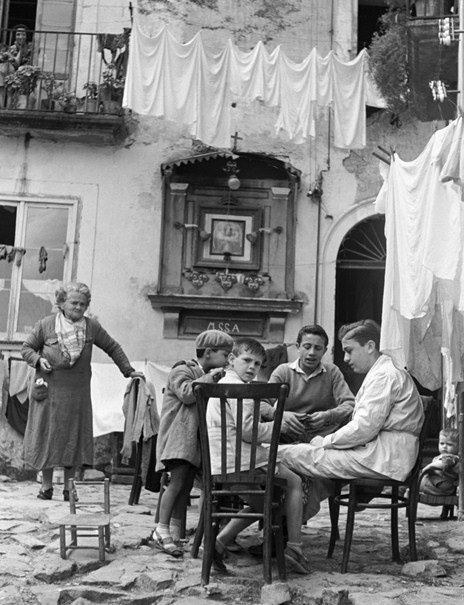 Even back then, and even for the Roman contingency, where the then other half’s family lived most of the year, Naples has always had an air of potential skullduggery and this has always added to its utter charm : more scoundrel than terrible crook, but always best to err on the side of caution. And always, always, the sprawling city holds a unique place in Italy’s history. I can already feel the magic of Ferrante’s compelling writing after reading just the first quarter of this particular story. She so faultlessly depicts such an authentic atmosphere, very much of its times, and above all you feel as though her protagonists are flesh and blood individuals walking the streets, and they are living and breathing every step of the way. Vendettas are commonplace, violence is a constant: slaps at home are customary, brawling is a nightly occurrence, just as the over-exuberant competition over whose firework display can last longer is only moments away from becoming a potentially dangerous attack on the opposition. The sense of claustrophobia pervades throughout: everyone knows everyone, and all dirty washing is hung out very publicly for everyone to see and comment upon. It’s a very tight, very crowded community and we’re frequently reminded of how these two women who are already so strong and passionate in their individual ways are constantly aware of their geographical limitations. It seems unthinkable that the sea is just down the road, yet for them it might as well be oceans away. The two of them are insatiable readers, yet their library borrowing does not stretch as far as reading newspapers and having much access to or interest in the outside world. The relationship between the two friends as related by Elena is fascinating: you share her sense of acute competition with Lila, you feel her emotion from the moment that dolly gets knocked down the shaft at the beginning, every bit as much as you share her discomfort when she questions her own morals set against people’s perceptions and preconceived ideas about her friend much later in the book. And you know that this friendship is going to be enduring, not only but also because of the cliff-hanger at the very start of this first book. 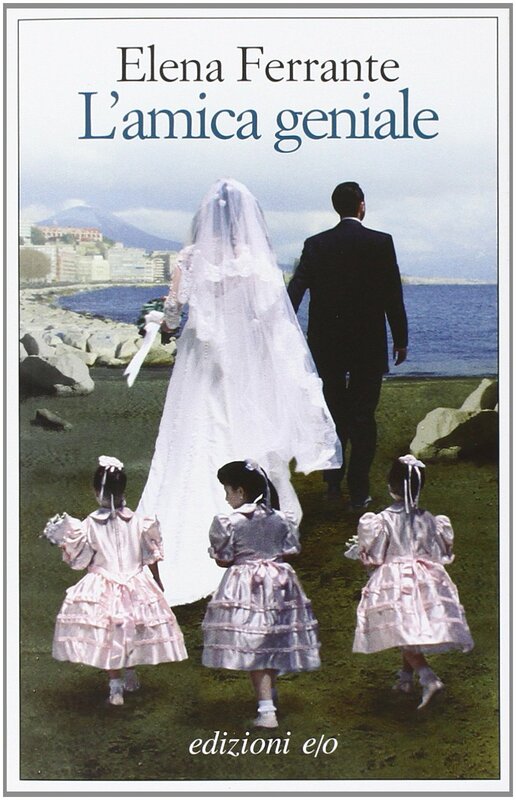 It’s rare that a ‘slice of life’ story manages to pull off closure the way Ferrante does: the wedding scene and the narrator’s thought processes in the final chapters are quite simply brilliant, leaving the reader avid to instantly pick up Book 2 to continue finding out what happens next. 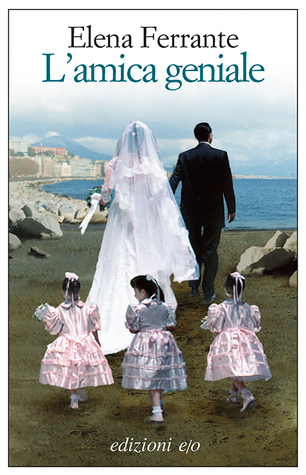 The world that Elena Ferrante has created is as real as anyone could dream an imaginary world would be. You can’t help but wonder how much is based on the writer’s own experiences, and to what extent. It’s quite a help having the index of characters at the start too, as it gets very easy to confuse your Antonio’s with your Alfonso’s, and I confess to having had a moment when the Sarratores practically reappear on the beach at Ischia and I couldn’t for the life of me remember who they were for a brief second of panic. From the start, though, whether you’ve physically been there or not, in your mind’s eye you can clearly envisage the rione her characters live in, you can see the dilapidated homes and the smell the mothers’ cooking, just as you’re aware of the possibility of encountering cockroaches and rats from the very first pages of the recounting of Lenù and Lila’s climbing of the stairs to the ogre of fairy tales Don Achille’s apartment. As Ann Mah comments in her article in the New York Times about “Elena Ferrante’s Naples, Then and Now”, the expression of bursting into tears twice in the South – once when you arrive and once when you have to leave – comes into its own here: the city has become a character itself: “dirty, dangerous and seductive, the place everyone yearns to leave behind, and the place they can’t shake”. There’s apparently been a huge upturn in literary holidaymakers mad keen to visit Napoli and see this brave new world for themselves. The Guardian’s Tracy McVeigh reported on Valentine’s Day that ‘Ferrante fever’ is bringing hordes of fresh tourists to the ‘Spaccanapoli’ area and that there is even more interest now that a 32-part series by the producers of “Gomorrah” will shortly be underway. ‘Ferrante pizzas’ now feature on many menus, and some cobblers have resourcefully put up their own printed sheets in the shop windows, claiming their particular calzolaio is the one that the infamous pair of shoes were shaped in. “Naples astonishes: with its many wonders. To dismiss the City as dirty and riddled with the Mafia is to put blinders on. 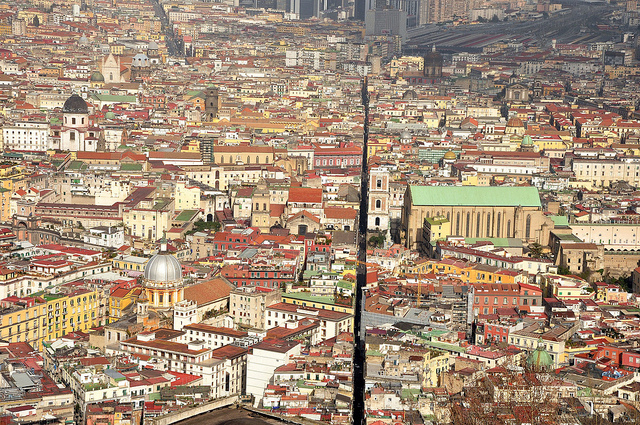 Naples offers to its visitors so much since it is a setting of singular beauty. A city that saw occupation after occupation plus the wreckage of war, and yet it arose like a phoenix out of it all, and embraces life. As one walks its streets and observes its crowds, it is impossible not to reflect upon the complex history of this extraordinary city. Accept that the streets are not the cleanest and delight in the treasures that the city has to offer. They are many and they await discovery for the patient observer. Naples reveals itself slowly and it unwinding is rather like its narrow streets. Go down any one and discover what lays beyond”. Does that not also want you to just up sticks and hop on a plane too? Images taken from here and here, here, here, and here and here. It can’t just be a happy coincidence. Am tickled pink, having just recently spent a truly joyous evening up at Montmartre as a very thrilled guest of the Global Nomads book group. Like Lucy and Sarah at Hard Book Habit who I am vicariously following as they travel around the world in 80 books, and Jen and Bookworm’s read around the planet at The Reader’s Room, the Nomads read authors literally hailing from all over the globe, from Canada to China, via Capri – and last night they dipped their toes in the Gulf of Naples, discussing Ferrante’s blow-away phenomenon that is “A Brilliant Friend” and the Neapolitan Novels. Having tried and largely failed to get cracking on a read of all things New Yorkish after that marvellous trip there last June (Shoshi’s Book Blog did a much better job of that), I keep pontificating about downing tools to read French/Paris-based works only for a given chunk of time, but somehow something else just keeps coming in to sway me off course – and now it has happened again, and I am seriously excited about a foray just across the Channel/the Irish Sea to take part in Cathy at 746books’ and Niall at Raging Fluff‘s “Reading Ireland Month” event – bring on “The Begorrathon” !! As Cathy comments, “Ireland is about so much more than shamrocks, St. Patrick and leprechauns. For a country the same size as South Carolina, it packs a hefty cultural punch. Ireland has produced four Nobel Prize winners; five Booker Prize winners; some world dominating musicians; a host of Oscar winners (and several nominated for this year’s awards) and a leading action hero from Ballymena”. After revelling in the Bafta awards earlier in the week, where Irish talent came to the fore so strongly and “Brooklyn” was named British Film of the year, and having recently reviewed Colm Tóibín and Emma Donoghue, just can’t wait to get going. Am spoilt for choice by what is already sitting here on the groaning shelf and feeling like I’m killing two birds with one single stone too, for no book-buying is going to be involved at all for this challenge, so this is going to carry me through oh so very nicely from the end of February to the end of March – by which time should have been successful in not falling off the proverbial perch with the three-month book-buying ban that began at the beginning of the year, ha. 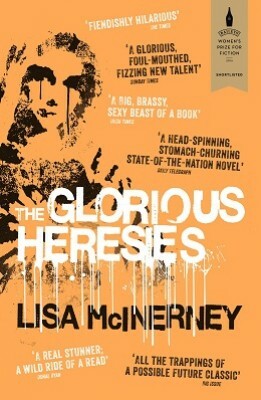 “The Heather Blazing” by Colm Tóibín (1992, early work…). As Mr Fry might well say (or words to that effect) – “what a splendiferous, fortuitous, jolly fine plan you have hatched, madame”. Images taken from here, here, here, here and here. The brilliant Baftas were just upon us again, and another baby star is coincidentally born, with the heart-stopping performance of Jacob Tremblay as five year-old Jack. When I read “Room” for the first time, my own daughter was 12 and we were still pretty well joined at the hip for any out and about-ing that was going on after school. Revisiting the story now with her the same age as Brie, sorry Ma, was when she was lifted out of her world and restrained in a 10×10 ft space at the age of 17 is almost too chilling to contemplate visually – which is of course what the film has now done so graphically. The more time passes the less enthusiastic I sometimes feel about seeing the written word translated to cinema, but I’m getting better at setting them apart. It was that way for “Brooklyn” and “War & Peace” and it was very much the same for “Room”. While reading the book, which I thought was staggering and oh so very memorable, I remember feeling a bit frustrated by the second half of the book. I believe Emma Donoghue captures the tone and vocabulary and mindset of a five year old quite fantastically, and I’ve enjoyed watching her interviews where she cheerfully admits to ruthlessly observing her own son at the time of scribing the book to really coin those phrases and attitudes. It works. 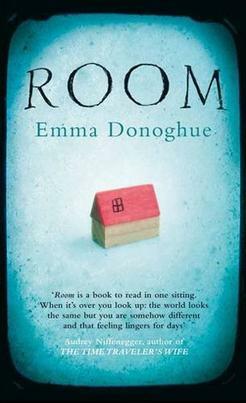 What would have made “Room” a perfect read for me (and even if not everyone has read the book am sure am spoiling nothing by revealing that the two do escape, thank God) would have been to have Ma take over the tale once the release from capture has happened and we follow their equally challenging times out in the real world. I did tire a little of Jack’s voice three quarters of the way through (maybe like in real life we all know we did on occasion with our own chattering Offspring at that age, dare I say it?) and very much wanted to be inside Ma’s mind and get a fuller sense of her experience. This is where I think the film is perhaps even more powerful than the closing chapters of the book. Towards the very end of the film there is a moment that absolutely knocked my socks off. No words involved, but it has stayed branded on my brain. Brie Larson, have to say, who was such a cracker in “States of Grace” and who I see is going to portray Jeanette Walls in “The Glass Castle”, is so terrific in this role of the girl-turned-mother, and couldn’t be more ecstatic that she has just won the Best Actress Award at the said Baftas. You get a very acute sense of her portrayal of the all-encompassing love for this child born in such extraordinary circumstances, plus there are little electrifying jabs during the film, such as the realisation of what the red marks under the threadbare carpet are, and her feral protection of her little boy when she sends him to Wardrobe. Good on Emma Donoghue for transforming her words to the big screen and doing the screenplay herself – it was a courageous thing to do and I think she pulled it off effortlessly. 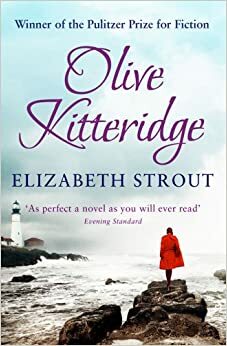 By the by, I read that she is now adapting her more recent novel “Frog Music” for a forthcoming feature film, so will be intrigued to read this book in the not too distant, although the reviews are very ‘love it or hate it’, hmmm. In my late teens, I had a big John Fowles phase and got very carried away with Meryl and Jeremy and was proudly swept away by “The Magus” (now that is a book I do need to revisit). In the light of the revival of “Room” just now couldn’t resist re-reading his first book “The Collector”. If you haven’t read it, it’s a good one to add to any list. It’s a very quick read and it will stay with you, scout’s honour. Frederick Clegg is an obscure little clerk and collector of butterflies who within the very first pages of his story nets his first human specimen, fresh and full of life 20 year old Miranda Grey, who finds herself pinned down if not literally then geographically in an almost as constrained and no less prison-like situation. These two books have much in common despite their own forty-year-old age difference. 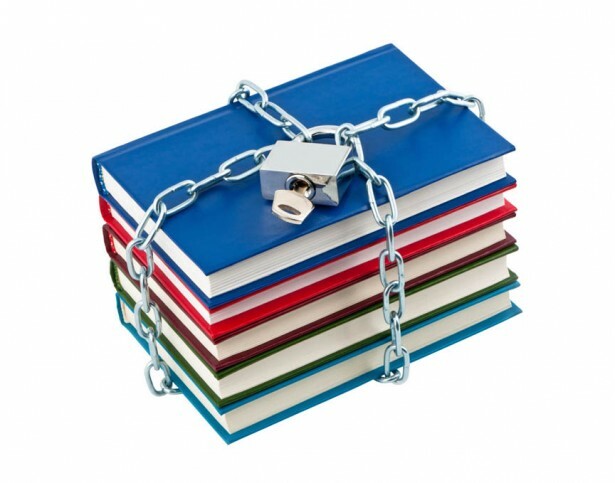 Both involve the unimaginable and the stealing of a young person’s innocence in their prime years; both explore the awfulness of being totally dependent upon a malevolent predator, who literally holds their lives in his hands – and indeed both books are divided into two main complimentary parts. The opening spiel on my copy of “The Collector” states boldly that “rarely does a publisher introduce a novel of such devastating power” and goes on to “invite you to open to the first page – we believe you will be compelled to read on”. They do not exaggerate. 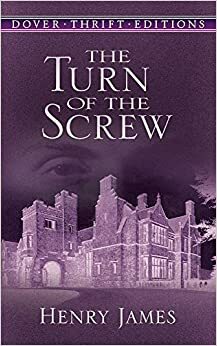 Fowles’ writing guarantees a jaw-dropping, skin prickling, discomforting read, and once you have started it you need to clear the decks to be able to push through to the very last page – and beware of reading reviews on it for fear of spoiling anything. It’s disquieting, it’s plausible (if now a tiny bit dated) and it’s utterly gripping. I see that a film was made in 1965, and once the book and dvd buying ban is over I will be sorely tempted to try and get my hands on a copy, as I cannot imagine anyone better than Terence Stamp to represent this Caliban character. “Room” – 9/10 : Man Booker nomination 2010, Shortlisted for the Orange Prize 2011, etc etc etc.